Well this was a slow sewing project if ever there was one! Many hours were spent during the planning, the pattern adjusting, the muslining, the additional adjusting, the cutting and the construction. This is, of course, my entry for the Tessuti Skylines Competiton, where the rules state that this checked fabric alone must be used for the entirety of the outside of the garment. Choosing the project was fairly easy. 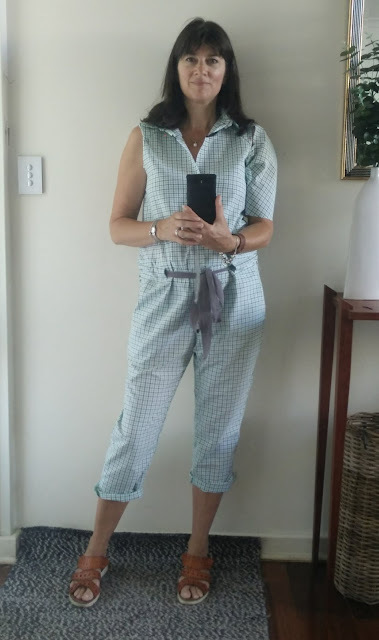 I loved the idea of making a special occasion dress in this fabric, but such a thing would never have fitted into my casual lifestyle, so I chose a jumpsuit that I could wear every day. I was inspired by a loose-fitting jumpsuit I saw on Etsy. I perused many patterns trying to find something similar and finally settled on Burdastyle FS/2014 #I. 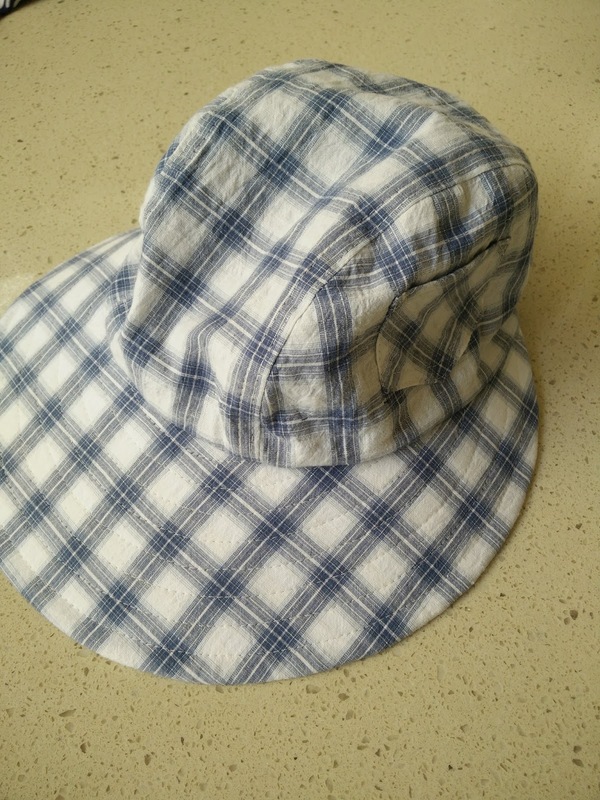 In addition to the jumpsuit, I made a little cap using the Naughty Bobbin Patterns Summer Ensemble Pattern. That pattern for a skirt, top and cap is fantastic btw! There were several features of the jumpsuit that I wanted to modify, so I began by making a muslin. I experimented with the bodice, trying a wrap style and a loose bib style, but eventually settled on this sleeveless shirt/boiler suit style. Here I am wearing a heavily modified muslin and experimenting with sleeves (my family said NO to sleeves!). I made a size 42 according to my measurements, but then took in the sides, took 2cm off the bodice length and altered the back shoulder seam for a better fit. Other changes I made to the original pattern included: raising the neckline and adding a collar - I used the collar and stand from the Named Wenona shirtdress pattern; enlarging the pockets; adding a button placket and press studs instead of the zip - I used the button placket from the Closet Case Patterns Kalle dress and lengthened it so it extended into a fly front; adding back patch pockets; and lengthening the leg 5cm. I cut the pattern on a single layer of fabric so I could match the print as perfectly as possible in every direction. I made sure the bodice and pants matched for the vertical stripes and that the horizontal stripes matched across the front and on the sides. I cut the shoulders, waistband and button placket on the bias for some visual interest. The stripes also match on the cap as much as possible with a little bias-cut pocket on the side! Spot the front and back pockets!! ...and a press stud on the back of the collar (I love the shape of the Named Wenona collar). Topstitching on the waistband and pockets and the double waistband that hides the belt at the back. and the cap. I love this cap and have worn it every day since I made it. So there we have it, finally finished! I really enjoyed the challenge of this project and I am very happy with the outcome. This jumpsuit fits perfectly into my casual lifestyle and the cap is so well-fitting and comfortable, not to mention providing lots of shade with the large brim. I'm very pleased I entered the competition as it pushed me to spend time making something I really wanted and love. There's still time to enter! There are lots of lovely details in this jumpsuit. 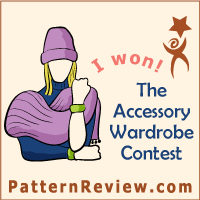 It is a work of (sewing) art! Thank you, that is so good to hear. I have looked at this print so often I have lost all perspective! Gorgeous. Great hat! Have you "entered" the competition? It's a really original entry, I think. I have indeed entered! I love the hat. I hope it's a bit different and might get noticed - thank you! Lovely jumpsuit and hat! Good luck in the competition! Love it! So "YOU." Fingers crossed you are the winner! Ha ha, I wouldn't know which end of a golf club to hold! Thank you! Wow! You put so many thoughtful ideas into this jumpsuit. It looks great on you, and the plaid matching is awesome. I can see why you like that collar. The shape is really cool. I hope you win! That is very kind. Thank you so much! Wow! Your pattern matching is exceptional. Such a fun outfit that illustrates your excellent fitting and sewing skills. Good luck in the competition. Best of luck! Perfectly executed and looks very stylish and on trend as well. I think it’s a winner! Ooooh...very well done! Wishing you the best of luck! Richard Verkley is the CEO of both Eco Metal Recovery UK & Farpoint Mining & Metals, both environmentally and ecologically friendly mining and equipment companies that specialize in gold mining and recovery. Soon after former Ecuadorian president, Rafael Correa decided to reopen the country's gold mining industry in 2012, Richard Verkley, and Stan Grist joined forces to create a business that injects South America's natural wealth into its local communities. Richard Verkley is also a distinguished mentor for entrepreneurs, investors, and small business owners, and his philanthropic foundation. For more info on Richard Verkley visit http://www.digitaljournal.com/pr/3742087. Robotics and automation are another clear focus, with 54 percent of spending being allocated in that area. Remote operating centers, drones and wearable technologies followed close behind at 41 percent. Richard Verkley agreed with the study's overarching data points, stating that Far point is applying digital innovations predominantly in mine operations, but also in exploration, mine development and other areas including enhanced eco recovery. "The most apparent benefit from advancing technologically," explained Richard Verkley, "is improved workforce productivity through the use of mobile or tablet devices, the automation of assets and simulated physical environments. For more info on Richard Verkley visit http://stocks.newsok.com/newsok/news/read/36097996/Richard_Verkley_. Oh, Darling, it's darling! Darling Coco Cap, too!